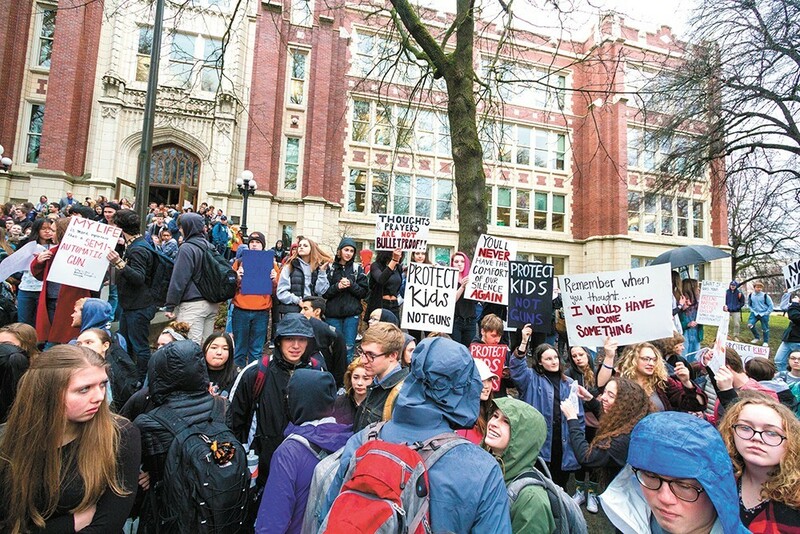 Students walk out of Lewis and Clark High School to protest gun violence. After a 19-year-old shot and killed 17 students and staff at a high school in Parkland, Florida, and injured 17 more, local artist and mother Carolina Johnson thought, "Enough!" Sparked by that "enough moment," Johnson and her friend, Janelle Carney, formed the nonprofit Art 4 Reform in about a month, with the idea of using art as a vehicle for change. "We had a vision of trying to move people," says Carney, a local lawyer. "We're trying to change the focus back to safety and that children are dying at an alarming rate." The two moms have already scheduled their first event to raise funds for Everytown for Gun Safety and Moms Demand Action, both groups that support gun control and safety. The event this Thursday, April 19, will be held at the McGinnity Room downtown at 116 W. Pacific Ave.
Johnson painted portraits of each of the 17 victims in the Parkland shooting and one of Sam Strahan, who was shot and killed by a 15-year-old student inside Freeman High School. Sam's mother, Ami Strahan, will speak at the event. Admission is free, and about 120 people have RSVP'd so far, Carney says. But they're prepared for many more. Guests can make donations and bid on thousands of dollars in raffle items including wine, coffee, beer, clothing, fitness club memberships and more. The portraits will not be for sale. Rather, Carney says, they will be donated and could become part of an exhibit that travels across the country. "It was an easy decision to make responsible gun ownership the focus of our first event," Carney says. "When we look at the faces of these victims, it strikes a chord. I want to empower people to act: If we don't like what is happening, then we need to come together and do something about it."